A mandolin is categorized in the same classification of instruments as a lute. This instrument comes in different types, which all have different sounds and peculiarities. They are quite different from guitars although there is a small resemblance. 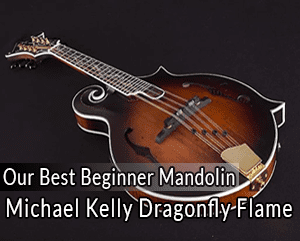 The best beginner mandolin can be fun to learn, regardless of whether you are a guitarist looking to expand your sound arsenal or a beginner. The mandolin is a beautiful and versatile instrument used for everything from bluegrass to classical. This instrument has been in use for a long time, but the common use presently is for modern musicians. It has a sound that can be easily adapted to various types of music. When its strings are plucked, rhythm and melody is created to accompany the song played. Buying a beginner mandolin and learning how to play can be difficult to learn (Source). This review provides you with the top models available together with the considerations you should look into, such as budget and type. This is to ensure that you select one that will suit your needs. The Michael Kelly Legacy is a gorgeous F-style mandolin with 8 strings. It is a beginner friendly instrument that has got style. On the top of its stunning make, it has a vine inlay located on the fingerboard that is made of abalone and real pearl that gives the instrument a custom look. Since the most important aspect of a mandolin is its playability, this instrument makes it easy for beginners to play. Its radiused fingerboard design will match the curvature of your hands. The ‘flame’ in Dragonfly Flame results from its stunning solid flame sides and maple back. What makes this product unique is its one-piece tailpiece that is integrated to pull ring and resonance when playing the instrument. This product is a good choice for a beginner looking to spruce up his or her new collection. The A Style Mandolin Model is a high-quality product that has a glossy sunburst finish made of wood. The fingerboard is made of walnut. The instrument features a maple top, neck, sides and back. It also includes an adjustable Truss Rod inside its neck wrench. With this mandolin, you should not worry about losing tone again. It has a classical adjustable compensated bridge that is uniquely designed. The bridge is held down by pressure of strings. It offers vibrant and warm sounds to your hands. The mandolin has been well crafted, providing you with a comfortable grip and lasting stability. Well-hand feeling is important to a good mandolin, which is reflected in the suitable thickness handle, smooth feeling and ultra-comfortable chord distance of this product. The product features a black ABS pickguard that protects the body of your instrument from getting scratches by your pick when playing. It also features a built-in strap pin for you to easily strap it. It is decorated with traditional ABS binding around fingerboard, headstock and body. The Washburn M1S is a traditional A-style shaped mandolin. It is an affordable instrument to get you started. It is handcrafted from maple, spruce and rosewood. It includes a solid spruce top and maple sides and back for great projection and bright sound. A professionally fitted rosewood bridge makes contact with spruce top to effectively capture and transfer string vibrations of the played notes. This instrument delivers excellent playability together with well-rounded tones that are key for a beginner’s mandolin. Washburn M1S combines premium materials and quality construction to deliver a mandolin that is ready to perform anywhere. Whether you are a rock, Celtic or bluegrass player, this addition will add a new aspect to your music. The Rogue RM-100 is the perfect instrument for a beginner on a budget. It is easy to play and to own. 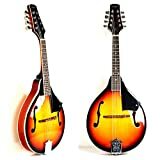 This is the best instrument if you want to try out a mandolin or are transitioning from playing guitars to mandolins as it helps in building up your playing skills. It gives you a high quality, rugged craftsmanship for a significant price. It has a bright, clear tone that is perfect for bluegrass, with good projection and aggressive attacks. It also features chrome tuning machines and has F-holes. It includes a traditional A-model shape with adjustable rosewood bridge and a comfortable maple neck. Its sunburst finish gives it a clean look, topped with gold tuners and nickel-plated frets. Experienced players may find its action set a bit lower out of the box than what they are used to. The Kentucky KM offers you a sweet tone and easy playability. The Kentucky is not only known for high-end craftsmanship but a beginner model too. The instrument is made of solid wood which is a plus. It sounds better than other instruments due to its carved top. Easy tuning of the instrument is assured by the accurately placed frets. It includes an elevated 20-fret fingerboard that frees up top maximum of vibrations. Its neck angle allows use of adjustable higher bridge in a correct vintage-style. This instrument is light with slightly wider string and nut spacing making it easier to fret. The binding of this instrument is ivoroid while the body and neck are fully bound. It features a rosewood fingerboard with MOP dots. If you are shopping for the best beginner mandolin, with a huge selection that ranges from entirely handcrafted professional instruments to simple types, the process can be difficult. You should ensure you find one that is right for your skill level, budget and music. The considerations provided below will help you narrow down your decision, making it easy for you to select one. While electric types are more expensive than the purely acoustic types, your intended use will determine the choice you make. Determine whether you will be playing with a group or by yourself or if you will be playing in a bluegrass band with the need of cutting through other instruments. Though the electric types are usually played and tuned like the acoustic types, their body types vary considerably. How they are electrified varies. Some are furnished with pickups same as those used in electric guitars. Others are basically acoustic instruments equipped with a pickup that transmits output to a sound system or an amplifier. The acoustic-electric models resemble traditional acoustic mandolins. But, they incorporate a piezo-electric pickup which converts vibrations to electric impulses. This is a good choice for you, together with using a microphone to cause feedback keeping you planted in one spot. Modern mandolins have three body shapes: F-style, A-style and bowl-backed. The best shape depends on the style of music to be played and the appearance preferred. The bowl-backed type has a dark tone suitable for classical, orchestras and traditional folk music. The difference between the F and A-styles is purely cosmetic. You may also find differences in tone and style. 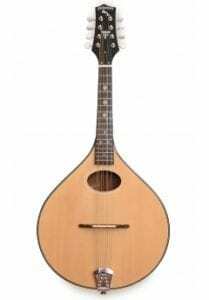 A-style mandolins have a pear-shaped body. To distinguish them from the bowl-backed types, they are mostly called flat-backed mandolins. The F-style mandolins have a more ornately carved body. Many current designs are based closely on the F-5 model. They have two F holes with all the points sticking out only on the lower half making it comfortable to be placed on laps. The F-style is the best choice for country and bluegrass artists. The bowl-backed are inexpensive but are mostly of low quality. The difference in body shape of the F and A-style mandolins have an effect on their tone, however materials used in construction are crucial to finding a good instrument. Different parts of the instrument are put under different kinds of stress. Mandolins are made from different types of wood. Each part has more and less ideal type of wood to help you distinguish between low and high quality instruments. The top of the instrument is a crucial part when it comes to tone. The best instruments have a top part made from solid spruce, a lightweight but strong wood. This type of wood is in high demand not only for making mandolins but also parts of guitars and pianos. 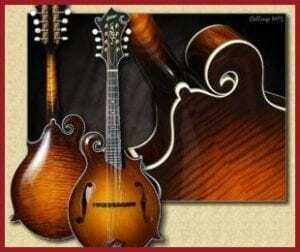 This means that many budget level and intermediate mandolins use cedar or mahogany. These types of woods gives the mandolin a deeper tone which may make it hard to cut through sound of a full band. The most inexpensive instrument has a top made from laminate, whereby several layers of wood are pressed together. The top layer can be spruce while the inner layers are made from lesser wood. The main downside is that it provides a lesser sound quality over time. Mandolin straps: This is a requirement is you plan to play while standing. There are multiple choices of looks and materials to suit your taste. Mandolin capos: This tool clamps on the fret board enabling you to raise the pitch so as to play songs in higher keys than those they were written in. It is useful for musicians whose vocal range is higher when compared to the song’s usual key. Mandolin cases and gig bags: They are essential when you plan to carry the instrument to gigs. It protects the mandolin from scratches and scrapes. Strings: With time, you will have to change the strings. A fresh set will also revive the tone of the instrument which seems to have lost its luster. Strings are made from various materials, each with different tonal characteristics. Tuner: A good-quality tuner makes the process of tuning up the mandolin easier. Some models have a particular mode for tuning mandolins making the process even easier. In your research, you will find that you can pay as little or as much as you want for the instrument. The cheap types are excellent for buyers on a tighter budget. You can choose to pay more for better quality of construction and high quality materials. Regardless of where you purchase the best beginner mandolin, ensure you try out different instruments to experience the difference in sound and quality. Even without knowledge for playing, you can still listen and select one that sounds, feels and looks better. There is no easy formula in selecting the best beginner mandolin for your budget and needs. Your ears and fingers should be the ultimate judge. One basic suggestion is to buy a mandolin that falls within your budget. A poorly made instrument that is hard to tune and play will most likely disappoint even the most determined learner. After reading the above guide, it will provide you with good basic information to help you pinpoint the right instrument.